Prof. White’s 2018-2019 ADUTA is one of 10 awards in Trinity College of Arts and Sciences for innovative teaching, advising and leadership. Trinity College and the Duke Alumni Association gives these awards annually in recognition of exceptionally strong teachers working across the college. You can read more about each of these awards in Duke Today. “Dr. White changed the way I think about the brain and about my own humanity…He absolutely promotes intellectual curiosity through his own love of the human brain, and his class inspired me to do all I can to delve deeper into learning about the organ that makes us who we are.”..
“Rather than calling assessments ‘tests’ or ‘quizzes,’ Dr. White prefers the term ‘readiness assurances.’ He is the only professor I’ve had who assesses students not to see how well they’ve learned the material, but to see how well they can APPLY their knowledge to real-life situations and have fun while doing it. Dr. White values team learning above all else, and the fact that his course is team-based allows every student to come forward with his/her strengths and build off those of their peers. He is of the opinion that no question is too simple or obvious to discuss, and this commitment of his to building his students into the best scholars they can be is something I find quite remarkable.”..
Prof. White joined Duke University in 1992 for postdoctoral fellowships. Following two fellowships, he joined the faculty in the School of Medicine in 1999. At that time he started to develop, direct and teach foundational courses in neuroscience and functional anatomy for on-campus students in the health professions. He continues to do that at present. Since 2008, he helped implement and now directs an academic major in Neuroscience for undergraduate (baccalaureate) students in the Trinity College of Arts and Sciences at Duke University. In addition, prof. White created a massive open online course, called “Medical Neuroscience”. This course is based on the course he directs and teaches in the Duke University School of Medicine, called “Brain and Behavior”. Students in this on-campus course also work through Medical Neuroscience. 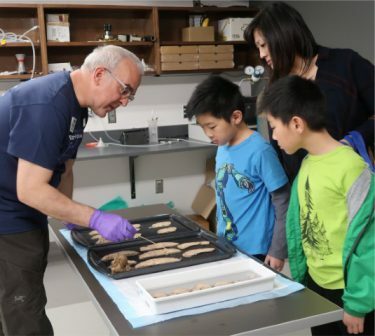 He uses the same approach in teaching his popular laboratory course for undergraduate students, called “Functional Anatomy of the Human Brain”. Thousands of digital students receive the course “Medical Neuroscience” with great enthusiasm and appreciation. As a result it has now reached people from all walks of life in nearly every nation. Consequently it has opened life-changing opportunities for many dedicated learners who share his passion for neuroscience. In research, prof. White studies the complex relationships between the structure of neural circuits and the functional properties of these circuits. His research work has been published in leading science journals. He is co-editor and co-author of a leading textbook in the field (Neuroscience) and he is the editor and co-author of a digital atlas of the human central nervous system (Sylvius). Prof. White sharing neuroscience with local families at the 2019 DIBS Discovery Day, sponsored by the Duke Institute for Brain Sciences (DIBS). Prof. White leads the efforts to assess the quality of the Undergraduate Studies in Neuroscience program for the Trinity College of Arts and Sciences. This is an annual quality-improvement effort. There are 74 academic majors and interdisciplinary certificate programs at Duke University. Each program undergoes annual assessment activities. This award recognizes Prof. White’s outstanding efforts in the 2018-2019 academic year assessing the quality of the Undergraduate Studies in Neuroscience program. Prof. White has received teaching awards before. 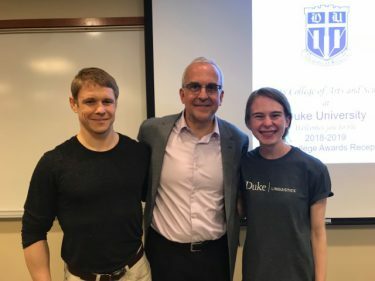 For example, the Duke Medicine Golden Apple Award for Pre-Clinical Science Faculty which he received in 2018 and 2016, as you can read in this article. Finally the online learning community certainly wants to congratulate prof. White with receiving this rewards. Above all he is the one that makes it possible to learn so much about medical neuroscience.